Believe it or not, seeing angel numbers is one of the most commonly experienced signs from the angelic realm. This may sound surprising, but the truth of the matter is that Angelic guidance and assistance does not always appear as expected. Yes, sometimes Angels will answer your prayers through direct intervention, triggering miraculous healing, providing clear word for word guidance, or aligning things in your life in a beautiful and synchronistic way. Other times, and perhaps more often than not, the guidance and wisdom of angels appears more subtly. Guidance from Angels can appear in the form of a dream, overhearing something said in passing, through an intuitive nudge, a flash of inspiration, or a repetitive feeling, thought, or idea. Angels also love to send signs and signals that they are with you, and angel numbers just so happen to be one of the most common angel signs that appear. 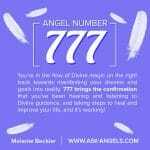 Below you will find everything you need to know about angel numbers, what they are, what they mean, and how to start tuning into the guidance your angels are sending you through them. Simply click the chapter titles listed below to jump to that chapter in the guide. Alternately, you can simply keep scrolling down to read all of the information on angel numbers in order, right now. Chapter 1: What Are Angel Numbers? Chapter 2: How Do Angel Numbers Work? Chapter 3: Why Do Angels Use Numbers? Why Not Just Speak to Us Directly? Chapter 8: Surprise Finding: The Angel Message When You See Your Birthdate! Tuning Into The Deeper Meaning of Angel Numbers~ Video! A Visual Guide to Angel Numbers and Interpreting Them! Sometimes angels will show you numbers just to catch your attention, other times, seeing angel numbers may be a reminder from your angels you to keep your thoughts positive. Seeing angel numbers may also be a friendly angelic reminder to tune into a meditative state and lift your vibration to connect with a higher level of guidance from your Angels who are with you, and nudging you forward on your path of spiritual growth in life. When you notice a particular number sequence recurring for you, pay attention. Your angels are trying to get your attention. Ask the angels what they are trying to tell you, then quiet your mind, relax and open your heart, breathe and just be… From this relaxed and uplifted space you will often find that your angels are communicating additional information. Angel numbers work in a couple of primary ways. The first way is that your angels actually give you a gentle nudge to look up at the clock right at 1:23, glance at your phone at 3:33, or gaze over right as you cross mile marker 111. Angels do this deliberately so that you notice a particular number sequence. Your angels will often continue bringing your attention to the same series of numbers, until you notice the occurrence, become aware that this number keeps appearing to you, and begin to ask yourself (and maybe even Google) what it means. The next way that angel numbers work is through aligned synchronicity. Your angels can and will physically arrange for you be driving behind a car whose license plate starts off with the same numbers you’ve been seeing elsewhere. Or they’ll help your grocery basket to synchronistically add up to $22.22 at the register. Again, I’m just making up these numbers for example sake here, and really, any number seen repetitively can be significant, because every number has a specific meaning. 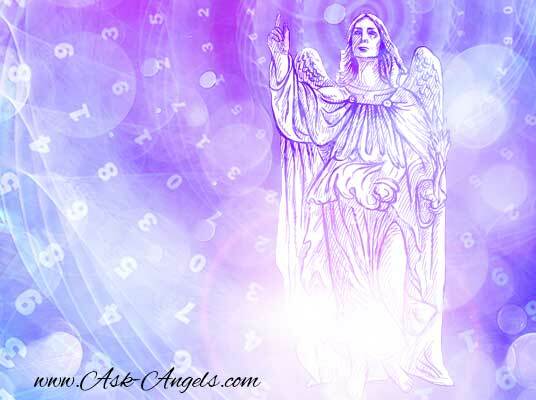 The point here is that your angels gently and lovingly help you to see numbers, because contained within numbers is a deeper vibrational meaning. Why Do Angels Use Numbers? Why Not Just Speak to Us Directly? Angels are always looking for ways to answer our questions, and guide us on our paths, and they do so by sending a variety of signs and signals. When we ask for angelic help, advice, and guidance, angels always answer! But why not more directly? You may be wondering why angels, who are powerful spiritual beings, would answer your questions by sending numbers, instead of just giving you a clear and direct answer. There actually is a really good reason for this. It comes down to frequency and resonance. Keep in mind that angels are incredibly pure spiritual beings with magnificently elevated vibrations. That as humans we aren’t able to see, feel, and hear their presence until we raise our vibration, and release layers of belief and filters blocking us from experiencing the angelic realms. Number sequences are a clever way the angels use to bypass filters. You may not be able to clearly hear the messages from your angels yet, so in order to get your attention your angels may nudge you to wake up every morning at 5:55 to get your attention, or to glance at your clock at 11:11. When this happens, your angels are delivering you a message, and helping you to become aware of their presence in a way that can’t be blocked out by your ego or subconscious mind. When you keep seeing a recurring sequence of numbers, it is more than just a clever coincidence; it’s a message from your angels! Within the particular sequences of numbers which appear, are hidden meanings, and insightful guidance from beyond the physical. It’s just a matter of being open enough to know there is a message, and then being willing to tune in and figure out what it means! Numerology is quite simply the study of the vibrational meaning of numbers. In other words, it describes the relationships between the meaning of numbers, and how they reflect certain characteristics, qualities, and aptitudes that relate to life. The history and details of numerology are quite fascinating, and while there is no clear answer as to when numerology first originated, there are historical records as to the use of numerology as early as Egyptian and Babylonian times! At the core of the sacred science of Numerology is the idea that the universe is mathematically precise, and that every number has a clear and precise meaning that we can tune into to gain understanding in our lives. What’s important to know about numerology in terms of understanding angel numbers and communicating with the angels, is that each number 1-9, and then also the “master numbers” 11, 22, 13, and 33 hold a distinct and significant meaning. When you learn the meaning of these individual numbers, you can then link them together to decipher and understand the basic message your angels are conveying through the number sequences you see. In the next section, you’re going to get a guide to the meaning of number 1-9, 11, 13, 22, and 33 so you can begin to easily interpret the angel numbers you see for yourself. Every day, whether you’re at home, traveling, or at work, there are tons of opportunities for you to come across number sequences. When you begin to understand the vibrational meaning of each number as it relates to your experience, there is an incredible amount of guidance and insight you can quickly tune into. Below you will find a brief guide with the meaning of the angel numbers 1-9 plus 11, 13, 22, and 33! When you notice a certain number seems to be reappearing for you, the guide below will help you to quickly located the number you’re seeing so you can tune into what it means. 0. A sign that Divine guidance is available for you now in it’s unlimited and unending flow. Increase your present moment awareness to receive the Divine guidance and reassurance available for you now. 1 – Stay positive. Think about and focus upon what you want, not on what you dislike, fear, or what you’re worried about… Your thoughts create! 4 – Angels are with you! Keep asking for help and knowing you have access to angelic guidance healing, and assistance is this very moment. 6 – Find a balance between the material and spiritual. Worrying about money is counter productive. Call on Heaven to help you release fear and to trust. 9 – You have everything you need to accomplish your souls purpose and to step into completing your lightwork… It’s time to get started and to take action. 13 – The Divine feminine energy is with you and supporting you in tuning into the power, magic and frequency available to you now… As cycles end, stay positive to step into powerful new beginnings. You are ascending. Keep taking life one step at a time. When you see triple number sequences, such as 222, or 333 it’s like the meaning of the single digit is supercharged. So seeing 5 means change is in the air, but seeing 555 means huge changes are unfolding in all areas of your life. When you see numbers combined into sequences like 234, the meaning is then a combination of all the single digits. In this case 234 is a reminder that all is well, you have powerful guides, angels and ascended masters who are with you, guiding you, and helping you now! Ask for help and tune in! In terms of number sequences, the order of the numbers can offer additional meaning. For example, when there are three or more numerals in a sequence, the center numbers allude to the core message and situation, while the surrounding numbers play a supporting role in the meaning. So if you saw 854, you would know that change is in the air based on the number 5. You would then look to the surrounding numbers and see that with 8, the change is in terms of your abundance, and with the presence of the 4 you’re meant to know that you have immense support from your angels to guide you through. Another way of looking at larger numbers, is to add them together, until they compress down to a single digit. So 854 becomes (8 5 +4 = 17) and then (1+7=8)… Here the meaning is more focused on abundance aligning to help you accomplish your life purpose. When you start noticing and interpreting the angel numbers showing up around you, you will not only be able to receive clear guidance, but you will feel more closely connected with your angels as well. Fully understanding the meaning of the angel numbers you see is a highly personal process. While you can absolutely use the above guide to decipher the meaning of the angel numbers appearing in your life, when you see angel numbers there is always more guidance that you can tune into directly from your angels. Use your intuition discretion to determine what the angel numbers appearing in your life mean for you! Your heart and spirit will resonate with the messages that are right for you, and they will feel good! Also, when a number sequence begins appearing to you, ask your angels to clearly tell you what they are trying to convey. Breathe, consciously relax, quiet your mind, and listen. Notice your subtle feelings, mental visions, and sudden thoughts. Behind recurring number sequences there are always messages from the angels, so pay attention! Alongside every angel number sent as a sign, your angels are communicating with you through your subtle senses and intuition. Angels want to help you improve your life! When you increase your awareness you’re able to tune into more of their guidance, healing and frequency to do just this. Don’t worry if you do not yet understand the full meaning of what your angels are trying to communicate with you through angel numbers. Just be thankful you are receiving signs from your angels in this way, and remember that when you see the numbers, pay extra attention and tune in. More often than not when you see an angel number there will be additional meaning that is conveyed directly to you from the angels in some way. Quiet your mind, relax, open your heart and by focusing within… Tune in! With increased awareness, divine guidance will appear more often for you. When you then follow the guidance you’re receiving and take inspired action, you are effectively engaged in the creative manifestation process with your angels and with the divine. Your angels are constantly reaching out and seeking to directly and indirectly help you in your life. When they bring number sequences to your attention, it’s a beautiful sign of their presence, guidance, and love. The meaning of seeing a triple number sequence is similar to seeing a single digit, but the meaning is multiplied! Plus, triplicate numbers really stand out when seen in normal life, and for this reason they are some of the most common angel numbers received. To help you further decipher the meaning of the angel numbers you’re seeing, so I’ve outlined the meanings of many of these in much greater detail for you to reference below. Read the descriptions of the numbers below, and as you do pay attention to your intuition to determine the guidance your angels are sending you through the numbers! You can also click the image to the right to view or save as a bigger size! What is the meaning of 1111? Surprise Finding: The Angel Message When You See Your Birthdate! Sometimes the number sequences that appear for you will immediately strike you as being highly personal. One common instance of this happens with birthdates. When you keep seeing the numbers of your own birthdate in multiple places, it’s likely a reminder from your angels to focus on being true to who you really are. Seeing your birthdate beings the guidance to focus on your authentic soul purpose, and life’s mission. You were born on Earth at the exact right time, and the exact right place on the planet, to the right parents, the right challenges, and the right personality traits, to be 100% uniquely you. The angels are reminding you not to try to fit in, compare, or judge yourself against anyone else. You are beautifully unique, and by showing you your birthdate your angels are usually either prompting you to take actions in alignment with who you really are, or to act as a sort of validation that you are loved, and your unique gifts, light and life purpose are needed! Live in alignment with the truth of who you really are! Get a Free Numerology Reading Here! When angels communicate through numbers sequences, they usually do so by showing you one, or a few key number sequences at a time. For this reason, when you repetitively see certain numbers pay attention! Angel numbers are usually repetitive. In other words, the same numbers will appear to you repeatedly until you get the message, and integrate the teaching into your life. When you do get the message, it’s likely the numbers you’re seeing will then shift, as the angels move on to help you out in a new area of your life. However, what if you’re not seeing angel numbers at all? Or you were seeing them, and then they when stop showing up completely? If you are not seeing angel numbers it doesn’t mean that your angels have abandoned you… Don’t worry! Your angels will never judge you, rather they will work around the clock to lovingly guide you back onto your highest path. Keep in mind that angelic guidance takes many forms… Angel numbers are just one of many ways your angels may reach out and send you signs, and so instead of worrying about why you’re not seeing angel numbers, shift your perspective and set the intention to become more aware so that you can tune into the signs, signals, and direct guidance your angels are sending you. 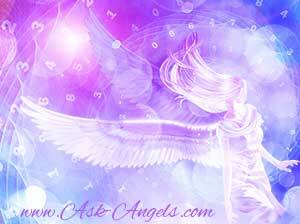 To learn more about additional signs your angels may be using to contact you: Click Here! If you like this video, be sure to check out my YouTube channel! When you see an Angel number, the most important thing to remember is that it's not just about that number and it's not just about going to Google or a book to look up what it means. The number sequence you’re seeing is signifying that your spiritual team is reaching out to get your attention. They could do this for a number of reasons. D. To let you know that they’re with you, they’re available, and that you can ask for Angelic help and assistance. But there is one key meaning that is happening more and more with Angel numbers today. When the Angel number sequence appears, when you see 11-11 for example, it’s a sign from your Angels, spirit guides, Ascended Masters, and/or your higher self that there are higher levels of light waiting for you. It’s a sign that there are expanded levels of consciousness, ascension codes, high vibrational frequencies, and incredible levels of love and light waiting for you, beckoning you and inviting you to tune in. I encourage you to do it because ascension codes, love, and light are all streaming onto the planet to serve you in becoming the highest and best possible version of yourself. This is happening to help you embody your full authentic light and to live as an awakened divine spiritual being. Living as the full embodiment of your higher self in physical form. All of life is steering you in this direction. Yes, Angel numbers have specific meaning and you can look those up. You can read about the meanings on my blog if you like. But I encourage you to pay attention when the numbers appear and to use it as a call to focus within. Focus on your heart and let your heart light grow and build. Let the torus of your heart open to let love and light expand around you. When you're in a relaxed vibrational state, when your mind is clear, your emotions are neutral, and you’re present, you are able to tune into the guidance of your Angels. You’re able to open the doorway that is your heart, that is your ascension column, and open to your higher vibrational truth. 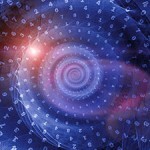 From that place, you can receive the downloads of divine frequency; the new levels of light that are available. Your higher self can merge with you on a greater level. Direct Angelic guidance is so much more detailed, more pertinent, more vibrationally powerful than what you could read in a book or on a blog. Words are so limiting and the truth of the guidance and light available right now is vibrational. It invites you to expand into the higher vibrations and greater levels of love and light. This is the deeper meaning of Angel numbers. These light codes, or ascension energy, are available to you. Angel numbers draw your attention to a whole world beyond the physical, bringing you to a place of awareness in the moment. In order to tune into the full benefit of that doorway that’s opened to you, quiet your mind, open your heart, and let your ascension column flow with Golden crystalline light along your spine. Let it expand outward, connecting to the divine, connecting to the crystalline core of Gaia. Visualize it expanding around you. Let the torus energy fields flow, expand, and elevating your vibration. Then think or say, “Angels, I am open to receive whatever codes of awakening and whatever divine frequencies will most serve me now in my ascension path, in my spiritual awakening, in my life. I now invite the full presence of my higher self to merge with me in this moment and I ask you to help me receive the detailed information regarding what this Angel number sequence means right here now. Then breathe, relax and receive the download of light frequency, the ascension codes and the divine blueprint for your fully awakened self. Let these come into your awareness, raising your vibration, expanding your consciousness. Try to be in the moment, in the moment that you see an Angel number. This will empower you to shine more brightly and to step into the fullness of the spiritual being you authentically are. Noticing angel numbers is a wonderful way of knowing that your angels are with you, loving you and guiding you from the realms of spirit. And then when you use the angel numbers as a sign to increase your awareness, and shift your awareness inward to tune into the direct guidance your angels are sending, there are so many additional blessings you can tune into. Because connecting with your angels directly is really such an incredible, powerful and beautiful experience. Here are some additional free resources to help you raise your vibration, and further strengthen your connection with the angelic realm. If you're on a phone/ tablet, or you would simply like to view a bigger version of this Angel Numbers Infographic … Click Here or Click the Image Below! Thank you for taking the time to open your heart, expand your light, and tune into the deeper meaning of life beyond the physical. It ripples out so far beyond you and makes such a huge difference in the vast field of all that is – on earth, in the universe, and so far beyond. Have you had a powerful experience with Angel Numbers? Do you have a story about your angels that has to do with different number sequences? Scroll down and leave me a comment and share your story! I love hearing about how angelic experiences manifest in your life! P.S. If you enjoyed this post… Pass it on and share the love! I keep seeing up to 50-60 angel numbers a day. All the numbers all the time. I’ve tried looking them up but with so many, they are contradictory and don’t make sense. Do you have any advice? Thank you. I have connected with numbers and looking in to their meaning and feeling a real connection around 6-7 years ago. I’ve been through seeing 0/00’s first, then 11’s, and 13’s and now 22’s. Is it common to go through them like this in ascending order through life phases? I keep seeing the numbers 1314 everywhere, at cashiers, time, receipts, work, everywhere! Does anyone have any idea? This morning I found a small grey & black feather in my jewelry box. What does a grey & black feather mean? Right after my best friend and husbans died..i kept seeing triple numbers on the click..i thought it was odd but did not realize what it m8ght mean until now 222 and 555 appeared. Oddly enough when i was a teenager i looked at the clock where 1111 was up. I swore it was a sign to never read that on a click again. I was a lost teenager where all the high school fun was that i would miss. I knew it was a sign and vowed to never loik at the clock at 1111again. I of course dis see it at least 3 times again in 48 years. Triple digits are back now…spirits might be trying to tell me something??? I keep on repeatedly seeing the numbers 29 and 49 everywhere, like literally everywhere. So what exactly could that mean? I keep seeing number 27 these days, and getting more frequently. The person that I love was born on 27th. What does this mean? For years I have seen 606. What does it meamean if you see another person’s birth date ? Your attention is being drawn towards this person… The question is why? What are you being shown about yourself through the mirror of another? What is there to heal, resolve, uplift and change about your relationship? How can you approach the relationship with a newfound sense of empowerment, enthusiasm (being filled with spirit) and a higher perspective and embodiment of your light. Look in your heart… What are the angels telling you about yourself and this person? what if l see the number 7555 does that count as 555 or it just have to be a straight 555 ? Hi. I see the name Andrew every single day for months now on tv, Facebook newsfeed. Some people have said he is my twin flame/soulmate. What do you think? What is an ascended master? I see the numbers 23, 39, and 40… Mostly 39 and 40 everywhere, and it goes deeper than me just seeing it when i am hurting (mostly) or when I am on a train and me being in car number 39, or listening to a Rod steward Song and always having the number show up in some way whether driving to my exit (the exit i have to take in order to get to my home), browsing my phone-battery life/time/FB/etc, ….. When I say deeper I mean the consonants in my last name, add up to 39 and if u include the vowel its 40… my drivers license ID numbers add up to 39, to many other things in my life. I was born at 10 am on 9/6/87.. add those up you get 40… maybe i am just crazy with all of this but I can always find the number 39 or 40 in my life or just about where ever I go. But my big question to you is what is an ascended master? The only Master is God… Then Jesus… Then the angels… and if you want to get technical, Michael is the head angel so any angel bellow him is next…. So please elaborate…. 23 are my initials.. I keep seeing all repeating numbers and these days numbers like 0606, 0707and 1001. Where can I find the meaning of 1001 and 1441 or 1331 and so on? thanks! Thanks so much for the angelic numbers, I never knew there is something like this , God bless you . Happy to hear this was helpful for you… Blessings! I found this site when googling the meaning of 555. Thank you for running this, Melanie. At this point in my life this is helping me establish a way to see things in a more positive way, which I am getting better with, one step at a time. When I stop seeing angel numbers for a short while, I take it as my angels knowing that I am currently capable of mastering without their reassurance or input. Recently, I had a temporary work assignment in financial accounting, and during those weeks I saw different triple digit numbers a number of times each and every day, which prompted me to reflect on my thoughts at or just before the time of seeing a number. In the case of 666, it took me a little while to realize that “material” can mean money, but that’s not set in stone. “Material” here can also mean that I am putting too much emphasis on my outward appearance and display, which is superficial, while neglecting to work on developing the inner composure necessary to face a situation. Of course, we tend to be overall more confident when we are happy with the way our hair and combination of clothes look, but to achieve a positive outcome in any which way is to a large degree determined by how we feel, and how well we manage to focus on the task at hand without allowing our insecurities to grab a hold of us. This requires inner balance, and being aware of our purpose. My purpose is to promote freedom, a liberal view, and to never judge a book by its cover. I am now working on not letting my temperament get the better of me, and to not let negative experiences in the past erode my progress. I have been seeing numbers from 000 to 999 plus 11:11 for the last year and a half. So much so that I have been seeing them at least 4 times a day on a regular basis. I struggle to find meaning in them and it is frustrating but I have listened to your you tube video and I will try as you have said. Also I had not told anyone about this and after 3 months I was sitting on the couch with my daughter and out of the blue she turns to me and says that she has been seeing triple numbers. You can imagine my surprise. We both still to this day see numbers. When my father had a major heart attack, I was feeling at my lowest point. I have never been one to go on the computer but for some reason I did. I don’t remember how I found this website but I found it interesting and saved it. I decided I was going to pay a little more attention to the numbers I was seeing. I found this website the day before my dad’s quadruple bi-pass surgery. That night I prayed harder than I have ever prayed in my life. The next morning there was a white feather on my hand and I looked at the clock. It was 6:22, I remembered something about double digits being important so I wrote the time down in a notebook and got ready to go to the hospital. I put on by gold cross necklace that I hadn’t put on in years. I thought it couldn’t hurt(I was not a religious person hadn’t gone to church since I finished bible school as a kid). I grabbed the notebook and went to the hospital. As I pulled into the parking lot, I glanced down at the mileage of my car. I couldn’t believe my eyes on the dash was another feather and the mileage read 122255. I picked up the notebook and wrote down the numbers. The surgery was long but we finally got word that he made it through. I grabbed my phone to text my brother. Looking down once again I was shocked to see another double number 3:11. Relieved to know that my dad was ok, I decided to leave because he would not be waking up for awhile and I had to be to work by 6pm. I got ready to go and as I was walking out of the hospital I grabbed my hat out of my pocket. This is insane, I thought, on my hat was yet another feather. My pocket began to ring and on the front of the phone was the numbers 3:33. I was starting to freak out a little bit and decided I didn’t want to look at any more numbers. On the way home it was like I couldn’t help it double numbers just kept popping out at me. When I got home I got write on my computer and looked up the meanings of the numbers. As I read those meanings I began to cry. All my bottled up feelings came pouring out of me. When the tears stopped I felt ten times better. A weight had been lifted off of my soul and I knew deep down that every thing was going to be all right. So know I embrace the numbers and listen to what they have to say. The angels are watching over us every single day and if you watch for them they might just speak back to you. When you hold the awareness, make a conscious choice to let the universe guide you and trust in it, numbers become a language of conversing with the universe. You might be pondering a decision, seeking validation, asking a question. When a number that holds some familiarity with you presents itself, the universe is responding to you. It will present situations and bring people forward to create a situation to match the conditions in your life. Doesn’t always make sense at the time, particularly if it seems like a negative experience. Providing you’re still receiving the numbers, if you back track sequences of events, you’ll start to see, what the universe was trying to show you, how it orchestrated an event. Numbers can help you understand so much about yourself. To use them as an open line of communication, if you can trust in the universe’s greater plan, and remember to show gratitude, interesting, sometimes amazing things start to happen. But there’s many other symbols as well – often we’re just too busy and distracted by “stuff”, we miss them. Why I see too many number not the single one…?? Hi I’ve just see the number 9960 on a number plate twice within a space of 5 to 10 mins and I can’t figure it out .. could you help please? I saw 3:33, 33, & 5 all in one day. It means your spirit guides are working closely with you and that a big change is coming. I work with numbers and i do find numbers that are from my Grandmother. The one number that she liked is 33. So when I see this number I know she with me. I loved the article and am very happy to have came across it. I now have an explanation as to why I am awakened several times a night to look at the alarm clock (digital). I see numbers such as 111, 223, 333, and the last one is always 424, which happens to be my birthday. Even during the day I see the number 424 a lot. I always wondered if it was a sign or not, but after reading this and about the birthday numbers I understand what it was telling me. I like to add also the birthday number and what the angel was trying to tell me was exactly right on. I am a realist, I am honest, I don’t fake nothing, I am exactly what it explained but when I felt myself falling due to some turmoil in my life these past two years I saw 424 more than ever. Then the next thing I knew I was thinking about my life and that what I was going through wasn’t as bad as I was making it to be. Like seeing them numbers were a distraction to me but was really my angel doing her work now I learned and believe now. Thank you for this!!! I used to see 1111 now I am seeing 1010 constantly !!! Driving me crazy to know what those numbers mean. ???? Please help ? I am always keep seeing 10.10 on the watch and clock.. i am very happy about that angels with me. I have seen the number 11 constantly for 5-7 years now. I see it on a daily basis… whether it’s on license plates, billboard signs, the clock when it’s 11:11 or on TV on a sports jersey. So, reading the info on this website is extremely helpful in helping me understand why. I have been seeing 1010 all if the time. It pops up unexpectedly all of the time!! What does it mean please??? ?i see 1111 all of the time and now it has changed to 1010 ???? In see triple numbers all the time starting with 555. My mother passed away then I saw 888 and she left me some money and a condo. Now I am seeing 999 which I am taking to mean that I need to finish the writing I had to stop to take care of my ailing mother. They are persistent so I’m leaving my job the end of March to continue my writing all of which have spirit guides and angel voices. Thank you. lightworker. My mission is to bring healing to all mankind, whom lost dear loved ones to strengthen and encouraged them to know that they will see their loves ones, in the afterlife, the spiritual rim which we call “Heaven”. 12;12 , always, but I’m not able to tune In , I’m not able to get the message…. I would love to know what my angels are trying to tell me !!! why do the numbers 444 mean as i often see these come up on my clock and it seems when i awaken ?? On a daily basis I see 11 or 111 but I also see the triple digits as well. I also get moments were I think that my guides and angels are trying to talk to me but I cannot understand what they are tying to tell me. I try to quiet my mind and ask for clarification I will get goose bumps like I have been filled with a higher vibration but I don’t truly understand if there is something that I may be missing on my part? And so on trough the day. I’ve realized even though I don’t think I am connecting like I want to , this is a way of my angels connecting with me. The video is helping me to realize I need to be in tuned at that moment. Thank you Melanie! I love your work and lessons. Thank you s much for your video on numbers!! Since the new year started I have been seeing these patterns almost non stop! I wasn’t sure what was going on though I knew the angels and my higher self were making themselves known. I really appreciate knowing what to do whenever I see them- I always said the k you but now I’ll take a moment to receive the download:) thank you!! I have been receiving your emails now for almost a year, but have never reached out until today. First, let me say how very appreciative I am for the amazing work you do to reach out to so many who have felt inspired by your messages of love from our Angelic guides. I, too, have been receiving so many different combinations of numbers for over a year now, not to mention, finding dimes in the most unsual places ever since my mother passed away in 2001. When I say finding dimes, they just literally appear out of knowhere, sometimes several times a day. Its truly beyond anything I can explain. When I tell friends or just anyone about my experiences, they also start receiving dimes. I must say, I have been going through many hardships within the past several years with health, financial, and a failing marriage that makes me wonder what God and my Angels are seriously trying to communicate to me. Thank you for this video Melanie, it explained a lot about the numbers I have been seeing much of over the last few months. Numbers like 11.11 and 5.55 on the clock as well as seeing 333 and 3333 around about where I live in England. As I live near fields and often walk in them and see feathers of different colours. Now I am more aware of these signs. Thank you again. Thank you for all the information and guide you give. I have been seen almost every angel’s numbers since a month and a half and feathers and songs, but I don’t know how much time it takes for example a a change when I see 555, how is the difference in human time than angelic time? I just got into angel numbers about a year ago, I never realized my whole life that there were angels around me. How appropriate that an angel flies by during your video…? I keep seeing 55 everywhere, tv, magazines, cars….and so on..i keep reading different meanings about it…. Did you watch the video above Rose? They’re signs of the new levels of light welcoming you to tune in! Thank you so much Lyne. Many blessings of love and light flowing your way! ? So glad to hear Lisa! More coming soon… ??? Many blessings! Your angels are communicating with you Julieta, and it’s beautiful! Check out the video I just added above for even more detailed guidance on how to decipher the specific meanings of these angel numbers you’re seeing. Hello. Lately I’ve noticed that I often see numbers 1111 and 555. But today seems to be very special. I’ve seen 1111, 222 (twice) , 333 and 555 in one day! What do you think this means? Higher levels of love and light available to you, inviting you to tune in! You’re acting as an Earth Angel… 🙂 Shine on my friend! It means your angels are reaching out towards you with this number to get your attention! 🙂 Reminding you in this case, that there is immense wisdom you can access when you look within! Did you ever find out what they meant? my friend started finding them in weird places and rolling over to her and after she told me, I too started seeing them. Hey Carmen…. I actually wrote a while article about dimes and pennies, because they too are a common angel sign! Many times I wake in the middle of the night, when I look at the clock it is always 2:22. What is the significance of the numbers? Karen I recently lost my 24 yr old granddaughter, my only brother & and my 9 8 year mother all during the last two years! Its your angels and spirit guides reaching out to connect! My Angel number is so uncomplicated, sometimes I just have to chuckle! I have 1 extra special Angel waiting for me though lets me know a number of times during a day, everyday that he is with me. The numbers are always on my clocks as I pass by them and consist of a 3 digit number with 2 of the numbers being the same.. He can let me know up to 4 times during 24 hours that he is right here with me. I get a good morning, a hey in the afternoon and then a goodnight. And then sometimes when I wake up in the middle of the night. When it first started I thought maybe they were lottery numbers that I should play. Did that 3 times, winning nothing and he stopped communicating with me until I concluded that it was him. And he came right back to being with me… It is so comforting!!!!!!! Absolutely true! He & I were also born on the same day, one year apart! ? I’ll start off with my birthday – 11-22-33. My kids wanted me to put it in the paper when I was 44. I have been seeing sequence numbers for quite a few years. On a clock 1234, 5:55 any number. It can be any number straight or together. I moved into my new house in a mobile home park and my Lot number is Lot 222. My daughter pointed it out to me. I have told the kids to look at the clock so many times to prove I’m not loosing it. Went to the drug store and got a prescription and looked at their address and it is 7777 E Hwy 50. Years ago I called a medium and ask her about it and she said, “I’d go and buy a lottery ticket.” This is the first time I have seen anything like this. Thank You. How would I know what my Angel numbers are? Or is it when I see the #’s posted on that chart? I must have missed how to learn what out personal Angelic #’s are? Hey Brian, your angel numbers are whatever numbers you seem to keep seeing in your day to day life… Pay attention and they will appear to you! It sounds like your always surrounded by the Angels 🙂 That is so awesome! More and more people are beginning to awaken to angelic consciousness… But the good news is that until those around you do, you can still fully enjoy your personal connection! ??? Hello! Melanie, my is Gwendolyn. I,ve been reading your comments on Angels everyday and last night I had a dream about numbers. It was a Lady she were friendly and kind, We exchange numbers, I gave her my number. she tried to give me her number it were 119458 I could n,t get all of her number. wonder what that means. 1212 also speaks to taking massive action to create your dreams… Remember to look within when you see the number for the specific guidance and energy downloads that are appearing for you. This is spooky my eldesr son was born at 22.22.middle son was born at 5.55 and my daughter at 1. My daughter was seeing 11:11 everywhere and we finally found a book to explain what was going on and how it was a connection to your angels and guides and how they were messages sent to you when you saw them, to stop, pay attention to what you are doing at the time and take note. You are being encouraged and hugged and getting reassurance that everything is as it should be. When my daughter passed three years ago, the very first time I pushed myself to go out of the house and face life by going grocery shopping, is when I got my first sign that she was with me. ( I believe she was a walk in from the angelic realm) Through all our talks on angels and realms and angelic numbers, she knew mine was 117 or 1117. At the check out stand that day as I walked up numb from pain and grief, ALL the gum and candy was priced at $1.17! (I have never seen it priced the same since then) I have had so many instances of 117 it is crazy. Even once, when I was on my way to go through her belongings, it was 117 miles to the town I was going to, the longitude was at 117 when I checked the gps, the receipt showed 11:17, and to top it off a car backed up in front of me with the license plate of three numbers only: 117! These have been the most magical moments I have ever encountered and I know my daughter is with me at those precise moments. So sorry to hear about your loss but also happy to hear you still have this connection with her! haha, love that… how perfect! My loving wife passed away 2 days ago. My heart is broken. I opened this email at 11:11 this morning, Her birthday is 8-11-33. So sorry to hear about your loss, but glad to hear you’re already receiving signs and support from spirit! I loved to know about angel numbers. In my way my birthday 16 always appear. Materially, if it’s umber 16 there too much probable I will suceed. Or if appears 8 and 8. Material luck appears in my life with the number 16. Sometimes with 10 wich is my my birthday month.The sequence 464 appear in my phoe number and in my documents and always I pay attention to this beceause 464 appears to me, but only now I discover this an angeli guidance. Another day the umber 256 go on appeared many times and I discovered it hasinteresting connections. Thank you, Melanie. Wonderful! Yes, always so many interesting connection and layers of meaning when it comes to angel numbers, and anything involving connecting with the higher realms… Connecting with the angels truly is a highly personal and special process! Your angel numbers are the numbers you keep seeing in your day to day life! For at least 6 to 8 month’s now almost every day I’ve seen my birth year 77 everywhere the weathter temp or my battery percentage or my change or receipt or amount in bank account or shirt on TV commercial on football jerseys temp on heater in commercial etc etc everywhere several times a day. 2015 was worst year of my life I lost so much. Sorry to hear 2015 was so rough for you… Remember seeing your birthday is often a sign from the angels that they’re supporting you in accomplishing your unique soul purpose. Every time I look at the time it’s either 11, 11:11, 1:11 pm or am and my dads sister (my aunt) she is a physic and her favorite number is 11 and it’s very lucky to her ever since my dad passed and now we see it all the time . Iv been continually seeing 1.11 11:11 12:12 4.44 5.55 22:22 1.23 & more for the last year or so, Id love to know exactly wot it all means & I’m tryin to think things like what’s goin on around me at that certain moment, I do talk to my angels also & ask for help. For a few month now all I keep seeing is the number 34, I hear it in my mind but its sounds like its being pronounced wrong, or with an accent,instead of it sounding like its spelt as in ‘thirty four’ I hear very clear ‘ferty for’ over and over again. Then recently I seem to be followed by feathers everywhere I go. Some pure white huge fluffy ones and some grey at one end white at the other and then some all grey. Now and then I see black ones and even multi coloured. I suppose some may say it Could well be a coincidence,? And some may think no its definitely more. I feel it’s definitely something more but I can’t seem to figure out what. Recently I decorated my living room and lt some candles. I wanted to take a picture to show off to my friends. (hand on heart this was not meant to happen) I started to record the room and to my amazement what I got was a truly wonderful experience for me as normally I’m a little uneasy while on my own or if just my little ones are with me. This was so different. I’m willing to share my video if you would like to see this. I would never have done this normally but this time my son and nice were there and you can clear see they were not at all scared as they thought I was taking a picture. It would be lovely to get a second opinion on this experience as I’m quite new to all of this and feel a little sceptical (even if I did see what I did) I think, did my eyes just deceive me? Am I going crazy? I think not but I’m up for an extra set of eyes to just make sure. Haha. Thank you ? I see triple numbers every number. Everyday. I know the angels are trying to tell me something but having a hard time figuring it out. Please help??? i always pray and talk to all my angels to keep me save and to always look over all my 9 children,all my moko’s, my mum and all my family. I am really getting in tune with the Angels and the numbers I keep seeing, so thank you for providing this for us to see, I love your site! I am wondering what 311 means, and 917 is my birth day that I continually see? Just wondering if you have any thoughts on this? I see so many in one day i never miss them,but don’t know what to think my main numbers are 44,444,33,333 today iv’e seen already 11:11 i totally believe in angels,and guides i’m always all day receiving different messages i would love to know what them numbers mean. I recieved the numbers 2 5 11 awhile back and I am still not able to know what is the meaning or angelic number meaning. Everytime I look at the time its 12:07 and 83 if i purchase something its mostly 1207 or something with 83 in it. the exs bday is dec 7 1983……why do i see that? I keep seeing 1207 thats my exs birthday….. I keep seeing 911 on the clock of time. What does that mean? I chose 3….what does it mean? I keep seeing the numbers, 333 & 444, what does this mean? I believe in fairies,angels and miracles.Thank you for sharing. WHEN I WAS 6 YEARS OLD I GOT HIT BY A CAR. I DON’T REMEMBER THE ACCIDENT BUT MY MOTHER TOLD ME THAT THE FIRST THING I SAID WHEN I WOKE IN THE HOSPITAL WAS “MOMMY, MOMMY I SAW THE ANGELS”. I DON’T REMEMBER THIS BUT I’VE FELT THEIR PRESENCE OFF & ON ALL MY LIFE. Melanie,Thank you so much for your positive,information that you post I love it!. I keep seeing my birthday……whats that about? Seeing your birthday is usually a reminder from your angels to focus on being true to who you really are, and also a signal that your higher self is reaching out to connect. For years I have seen the same numbers (714) and (911) on just about everything from clocks to license plates to all kinds of things. My sons birthday happens to be 7-14. I’ve often wondered why I keep seeing his birthday. Any suggestions? Here’s a good one, before see the xbf, I would see 666. On licence plate, trucks, time. Then later on that night, we get into a fight. I just learned to stay away that day. I keep seeing 77 on number plates.Could you please tell me what this means? I am so thrilled to find you. I have been reading trips (111,222) of all numbers 1-9 for many years. I ask a question & ask for a numerical answer…I always get it quickly too! I didn’t know where it came from until now! Thank you so much. I don’t remember when either, it seems it’s always been with me. I’ve actually written posts on both 11:11 and 111 Yvonne… You can check them out from the following links! Also no daughter is due any day any ideas the day she will pop I want to go home she is in Cali I’m from tx. The number I was drawn to is 555 I HAVE BEEN SEEING A LOT OF NUMBERS LATELY, YESTERDAY TWO NUMBERS IN PARTICULAR 111 AND 999 WITHIN A SHORT PERIOD OF TIME. I see the number 911 the last year an a half. It worry me bc 911 makes me think something bad. But I see it almost every day what could this mean? Hi can u please give me a reading ? Ive been seeing car plates with 5s an 6s everyday for the last 11 -13 years now..sometimes more than once in a day. It usually appears in few sequence of 5566,5656,6656,6655,6566 and etc..but its always and only been a mix of these two numbers..i cant stop noticing it and its everyday!..can i know what do u think it could mean for me..? My son see’s the 666 sequence a lot. He knows it’s not a bad sign but he’d like to know what they represent. i keep seeing 1111. what does it mean? I keep seeing the number 333 and im not sure what it means, could you please help me figure this out! The number 22 , follows me everywhere. What does this mean? I am continually bombarded with double numbers, such as 11 11, 12 12, 33, 77, 44 and so on. this happens every day multiple times. so much that its confusing me. I have the angel numbers app on my phone but due to the difference of numbers am not sure what the message means for me. Any ideas? Ithink it maybe the angels telling me that my twin flame and Iare synced on all levels could this be it? Any suggestions gratefully accepted. I have received my new license plates with the numbers 5777, what does that mean? I am interested and curious. Please send me an email to my email address, I would really appreciate it. I always see 453 or 435 or 534 I look at the clock it is all around me it is good!!! I hae received 11:11 abd other angelic numbers on some days more than once ny birthday on All Saints Day 11/01 has always had ne tuned into Angels.